It was a time of protest and war. The whole world was in turmoil and nowhere more so than behind the bleak grey walls of America's toughest prison - the monument to misery and violence they called Attica. This is the terrifying story of courage and conviction amid the chaos and horror of America's bloodiest ever prison uprising, directed by the acclaimed JOHN FRANKENHEIMER, creator of such screen classics as 'THE Manchurian Candidate' and 'Bird Man Of Alcatraz'. With both guards and inmates caged like animals, Attica was a timebomb just waiting to explode. In this pressure - cooker of brutality, strange bond of humanity was forged between a young rookie officer and the Black Panther leader of the revolt. But their passionate belief in human rights, respect and dignity were about to be engulfed in the flames o hatred, predjudice and revenge. . . and the world would never be the same again. Starring KYLE MacLACHLAN ('Blue Velvet' Twin Peaks'), SAMUEL L. JACKSON ('Jurassic Park'), HARRY DEAN STANTON ('Wild At Heart'), CLARENCE WILLIAMS III ('Purple Rain') and FREDERIC FORREST ('Falling Down'). "A Super Heated, Throughly Absorbing Movie Thriller ." "Intense. . . Powerful. . .Will Chill your Soul." 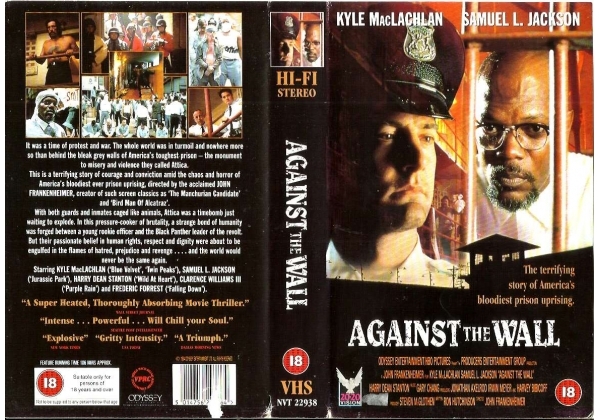 Or find "Against the Wall" on VHS and DVD / BluRay at Amazon.